Harold McKinney was one of the leading musicians in the Detroit jazz scene for over sixty years. As a child, he first took classical lessons with his mother Bessie Walon McKinney, an organist, but it wasn’t long before he fell under the influence of Charlie Parker's music and he turned his attention to jazz. After graduating from Northwestern High School, McKinney attended Morehouse College in Atlanta and, after returning to Detroit, he studied briefly at Wayne State University before going to Germany to undertake military service. After returning to the United States he worked with a wide range of jazz folk including Roy Brooks, John Coltrane, Kenny Burrell and Wes Montgomery. But it was with his association with Marcus Belgrave, Wendell Harrison and Phil Ranelin that McKinney is most fondly remembered, especially by the jazz community of Detroit. It was as part of the Tribe Artists' Association that McKinney found a new voice at a critical time. A voice that resulted in one of the prime releases on the Tribe record label, one of the leading black label collectives of the 1970s, along with Strata East and Black Jazz. Tribe was not only a record label, it also published a magazine that focused on music, politics and topical cultural issues relevant to the black community. Tribe’s musical span covered a wide range of styles: soul, bebop, hard- and post-bop, modal, funk, groove jazz, vocals, avant-garde improvisations, and so on. 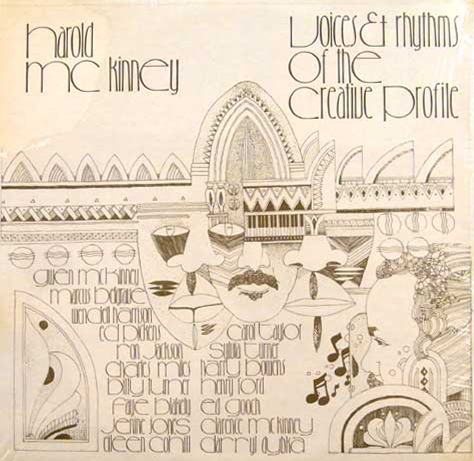 Amongst this diverse palette was Harold McKinney’s debut album as leader ‘Voices and Rhythms of the Creative Profile’ released in 1974. Focusing on some of the tracks on the album, McKinney explained the ideas that inspired several of his compositions. “‘In the Moog’ acknowledges my growing awareness of the musical possibilities inherent in the use of electronic instruments and technology which was finding expression in the music of major recording artists like Miles Davis. ‘Freedom Jazz Dance’ is a piece written by Eddie Harris, and it inspired me to write lyrics that spoke to the spirit of the late 1960s and early 1970s. The late jazz vocalist Eddie Jefferson incorporated my lyrics in his hit recording of the composition in an album done for Columbia Records just before his death. Considered one of the most important mentors of jazz in Detroit, McKinney worked as a music educator and held classes and workshops at the Detroit Serengeti Ballroom. He also created jazz programs at Oakland University and Wayne State University, delivered his programs in public schools and various festivals, taught at the Metro Arts Center and numerous summer youth programs, and produced a weekly jazz workshop called Detroit Jazz Heritage Performance Lab (DJHPL). In 1994 McKinney and his band The Jazz Masters went on a tour through Africa and the Middle East. Sadly, in May 2001, McKinney suffered a stroke, and died the following month.